Even the most ambitious among us know that it is extremely difficult to stay motivated all the time. In fact, motivational challenges are part of life. Even though nobody likes to admit it, we are all confronted with this problem. There is, however, a small detail that makes all the difference: your ability to deal with motivational challenges. Interestingly enough, some seem to be extraordinarily gifted at this. It seems as if they are able to (miraculously) keep their motivation constantly at a high level, thus avoiding falling into a slump. What seems impossible at first sight is the result of following a system that is easy to implement, yet astonishingly effective. 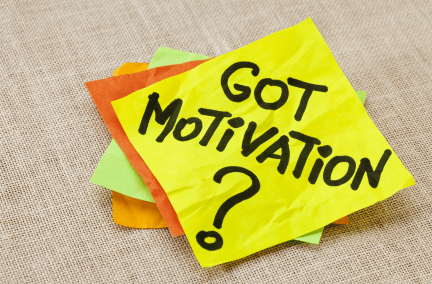 Are you struggling to get motivated? Do you feel like not doing anything? Then let’s have a look at the most effective strategies successful people use in order to quickly boost their motivation. Surrounding yourself with people that are higher performers than yourself will substantially increase your motivation and performance, as scientific research suggests. Financial incentives, however, can have a negative impact on your overall performance, once you have achieved a reasonable standard of living. Before getting started with the really powerful stuff I want to show you one little trick you can use to quickly increase your motivation. Astonishingly, most people have forgotten that music is an incredibly powerful source of motivation. It can elicit positive emotions, stir a spirit of optimism and will get you energized quickly. So why not make use of motivational songs? Turn your speakers on or put on your headphones, turn up the volume and listen to whatever song that gets you pumped. So much for the introduction, let’s continue with the strategic approach. 1. Do you have a mission? All the revolutionaries that profoundly altered the way we live had one thing in common: they all had a mission. Their ambition to contribute to the evolution of mankind was so strong that it allowed them to keep going, no matter what happened. They got back up on their feet after each failure, no matter how severe, shook the dust off their clothes and continued to pursue their vision. Having a sense that you’re fulfilling a greater purpose is, perhaps, the single strongest source of motivation that you can tap into. Knowing that what you’re doing is helping others can be astonishingly motivating. Identifying with a cause greater than yourself is driving the deepest motivation. It’s what gets you out of bed feeling energized, day after day. Not only did this, but it will also enable you to find solutions to the great challenges that stand in-between you and your mission. No matter how long it takes. If you need further confirmation of the strong power of having a purpose: Research showed that infusing a task with a purpose can lead to a higher performance. What are top athletes doing shortly before an important match? They follow a pre-game routine that gets them into “game mode”—the kind of mental state necessary to peak performance. Interestingly enough, this routine helps them to establish the right mental frame, no matter how unmotivated they were just a couple of hours before. This phenomenon is not at all limited to sports. When you have a look at the top performers in their respective fields, you’ll notice that they all have developed some kind of routine that gets them into the right mode. No matter if they need to be heavily concentrated or excessively pushed, their routine acts as an anchor that allows them to quickly switch into the required frame of mind. Wouldn’t it be incredibly helpful if you had a routine that could get you quickly into work, study or exercise mode? Be like a top athlete and develop your very own routine that gets you into the right mode. Whatever you do, do it with the attitude of being a top athlete, warm-up routine included. Step 1: Start your routine with something really easy, something that helps you to get started, for instance putting on your favorite running shoes. Getting started is the single most important part of any task. Step 2: Continue with physical movement that brings you closer to starting your task. Remember the time you didn’t feel like doing anything? Well, you were most likely lying on the couch, watching TV or listening to music. A lack of physical activity contributes to less motivation. You could also take a cold shower, it will definitely energize you. Step 3: Enhance your routine with a series of activities that get you into the mode. Athletes use stretching for this purpose, but you can use any activity that you perform in the very same pattern before committing to a task. Performing the pattern will allow you to get into the right mental state. Setting a reward for accomplishing a goal is a tactic that I use when everything else fails. Usually I resort back to this strategy whenever I’m confronted with a really difficult project that I cannot motivate myself to do. Basically, all you need is something that you desperately long to possess or want to experience, for instance that fancy new smart phone or watching the Super Bowl final live. The stronger you want it, the better. What I then do is to tell myself I will be rewarded with the very special gift of my choice as soon as I have accomplished my goal. It goes without saying that failure is not an option, because if I do fail I will not receive the reward. Following the strategy I failed once or twice. After that my anger of not being allowed to replace my five-year-old mobile phone with a smart phone was so huge that it made me go every extra mile in all “goal-reward-projects” that followed. No motivation necessary. The willingness to work hard for a reward will also increase dopamine levels in two areas of your brain that are heavily impacting your motivation. Time to give it a try. 4. How badly do you want to succeed? Let’s be honest: if you want something bad enough and you really want to see it implemented, then you’ll be motivated to the teeth. There’s nothing that can stop a person from pursuing a vision they burn to see accomplished. No mountain is too high and no distance too long for someone with a fueling desire. It’s as simple as that, we both know it. The question is: do you really want to succeed? If you’re constantly facing motivational issues you might not have developed the necessary mental willingness to succeed, yet. Ask yourself what the reason for this is. Try to get to the bottom of this question and find the true passion that makes you want to succeed as bad as you want to breathe (after being under water for more than a minute). If you want to succeed bad enough, a lack of motivation and a couple of obstacles shouldn’t be a problem, should it? We all face nasty challenges and difficult responsibilities that we just cannot get motivated to tackle. Sometimes even thinking about these activities will give you shivers. What usually happens is that we start to procrastinate until we finally meet the decision to avoid the task entirely. Highly motivated people are different in this respect. They all share the characteristic of being able to focus on the higher purpose of a task, which allows them to maintain a reasonable level of motivation. Instead of drawing their attention on the difficulties of a task they direct it upon the underlying vision they pursue. Doing so helps them to draw the necessary motivation to tackle even the most unpleasant tasks. You can make use of this trait by reassuring yourself the important share a specific task contributes towards the goal that you pursue. Inspiration is the second most powerful source of motivation, besides having a mission. But where can you draw inspiration from? Personally, I become inspired by other people who managed to achieve whatever it is that I also want to achieve. There’s a simple way to use inspiration as a catalyst for motivation. Simply look for the role models that have excelled at whatever it is that you need to do. For instance, if you need to find the right motivation to pursue your entrepreneurial activities then read books and magazines or even blogs by inspiring entrepreneurs who have managed to accomplish the most amazing things. Inspiration will work wonders upon your motivation. All you need to do is find the right people that inspire you. I noticed something interesting: whenever a person inspired me with their story I immediately got excited to try something of a similar nature. Without even noticing it, the excitement helped me to pursue my new agenda, without getting into a slump. This was when I realized how important the excitement about accomplishing a goal can be. For this to work, however, you have to set yourself the right kind of goals that get you excited. You can also add anticipation to further increase your excitement: Instead of setting a goal and starting to work towards its accomplishment you will set a goal and a given date in the future upon which you will start pursuing your goal. This way you will build anticipation and excitement about your plans. A lack of motivation gives us a hard time getting started. This kind of mental sluggishness is the major issue that needs to be overcome. Overthinking the problem, however, does not solve it. Whenever you’re not motivated to do anything, try your very best to get back up on your feet and to start doing what needs to be done. If necessary, force yourself to do it. Don’t whine around, complaining that you feeling sluggish, lazy and not motivated at all. Playing the victim wastes important time. Instead, start to take action and do something about it. Ignore all those more pleasurable activities that you would rather do, none of the matter. None of them will help you reach your aims. They are useless time wasters. Most of the time, this is the biggest burden you will have to overcome, but as soon you did cross this boundary it will be much easier to complete the task. Another important point to keep in mind is to stick with whatever you’re doing until your goal is reached. Far too often I made the crucial mistake of interrupting the pursuit of my aims “only for a couple of days.” Don’t do it. First it will push you out of your routine and might even interfere with your motivation. All it does is built up new obstacles that prevent you from starting all over again. Stick to a task, even if you’re not feeling motivated. Don’t give up just because some problems are causing trouble. Very interesting read. The idea of listening to motivational music is a good one. I remembering going to a few network marketing events a few years ago, an before the main speaker came on stage they would play “The only way is up”. It certainly got people into the zone. I also find writing your goals on post it notes, and sticking them everywhere you can see them helps. You’re absolutely right. It seems that music can effectively get us into the zone. I love your idea about Post-it notes, especially because you can stick them to places where you see them continuously throughout the day. Fantastic suggestion. I love the part about wanting it badly enough, as badly as you want to breathe! I think that’s what often separates the action takers from the people who talk all the time but never get started. Those that follow through get to the stage where they don’t just want success they NEED it so badly that nothing will stand in their way! As I get a bit older I find that craving growing within me, as you come to realize there isn’t an infinite amount of time left. Enjoyed your piece, helped motivate me to do an extra hour of work tonight! Thanks Luke! I’m glad the article motivated you. Sir my name is Ritvikku from india. What you need to do is to try to identify the root cause of the problem. Ask yourself what the problem is. Many students struggle with motivation. Others struggle with the ability to concentrate and focus. As you can see, then many different reasons why students struggle. For this reason it is necessary that you find out what it is precisely that interest you the most in your current situation. And once you’ve identified the problem, feel free to contact me again to find a solution. And I believe I had been really stupid making blunders..and not solving things with calmness..
Would my stupidity result in great failures in life..? Or else that has nothing to do with anything in future and should I start my lifeall over with enthusiasm forgetting everything? Yes, I do remember you. What I always tell people is that motivation is not something external. It’s all within you. Either you learn to motivate yourself, or no one else will be able to do that. This is not how it works. And quite frankly no one else should be responsible for motivating you. Others can help you, they can point you in the right direction, but in the end, you have to walk this path for yourself. If you seek motivation from external sources, then this motivation will only last for a certain period of time. But once you are able to ignite the fire within you, and you’ll be able to benefit from the long-lasting motivation that comes from within. But to ignite this fire, what you need in your life is a purpose, a vision and a mission. Something that you strive for. Think about all the great man in history. They all have a extremely challenging mission in mind which kept them going through all opposition. You’re worried about failing in life, which is understandable. Everyone is. But what you need to understand is that whether or not you will fail, entirely depends upon yourself. If you continue living your life the way you did, then failure after failure might be an option. But if you finally make the decision to change your life for the better, and every aspect of it, then you have every option for a great future. It all depends upon yourself. Choose complacency, laziness, dullness, entertainment, quick rewards, little effort etc. today and you will be rewarded with failure in the future. But if you choose dedication, perseverance, motivation, high effort etc. you will be greatly rewarded in the future. It all depends upon yourself. You can make it. I believe in you. But it’s finally time to make necessary changes in your life. Childhood is over. Informative, inspiring and tremendously helpful. This is just what I needed to get motivated. Thanks, and I’m happy you like the article. Excellent article, Sir. I am a 17 years old student who will face University entrance exam on 31 May. I feel tensed and got nerve Sometimes but somehow i found myself so lazy at some point and not Doing anything. I don’t think it’s because lack of motivation but maybe Something is happening inside me. How to help and prevent damage. Please pray for me so i can succeed. What I found to be extremely helpful is excellent preparation. It always helped me to reduce anxiety and reduce tension. Whenever I knew that I was properly prepared for the exams, I was less afraid. So the first step I would recommend is that you do the best you can to properly prepare yourself for the entrance exam. Secondly, if you’re feeling lazy than I would definitely say it’s a motivational issue. If you have proper goals and an excellent vision, you’ll burn so much that laziness will not ever prevent you from studying. So I would recommend that you try to set yourself proper goals and think about possible rewards that you only get once you have passed the entrance exams. Doing so will keep your motivation at a constant high level. I’m struggling to figure out the meaning and purpose of my life right now and to be honest, that’s what is leaving me unmotivated most of the time. There was a time when I was excited to get up in the morning and work hard for something. I’m struggling to get back there right now. Thanks for sharing this, Steve! I think it’s important that you find something that excites you. Keep searching and keep setting yourself ambitious goals. Everyone of us goes through a time of feeling depleted and not all motivated. What matters is that you keep going. Part of the issue I think some people face is they simply don’t have a good definition (if any) for what success looks like or what it will be in their life. While I complege agree that you have to want it and want it bad, you must first define it. Some will try to define success with the empty promises of riches or cash, which is a horrible measure for success and a terrible motivator for more than just a short time. It’s better to define success by looking at what you want in life outside of money. For me, it’s the ultimate freedom to go where I want, do as I want and enjoy life how I choose without the constraints of a job. I don’t need a million dollars a year or even half that to make that happen. Instead, I just need enough to help me become free. If I use money as my measure of success of define success with money as a huge part of the equation, I won’t be shooting for the right thing. If you get the definition of success for you correct, it will help guide that motivation, which is very important. Always have a mission or goal in your life if you want to get motivated. If you have mission it will arouse in you the ways on how to achieve success and the best way to achieve success is through personal development! Very Nice Article Steve, I have learned so much from it. I think this is the article which I have needed to stay motivated in my life. Thanks for sharing it. Great Article. I think I have learned the way to stay motivated in my life after reading this excellent article. That was one of the best dissertations on the subject of motivation I’ve ever read, thanks so much for sharing. One thing that I’ve found that has helped me tremendously is to have a very enthusiastic attitude toward my work and chores. (This kinda goes along with what you said about whining and complaining.) I have found that not only do I feel better and more pumped up to get pressing chores done, but it also helps others. It is almost infectious and it will help other people get motivated and moving out of emotional dumps they may be facing. I did want to a shout out to Ben Ehinger, in the comments above, that noticed it’s much more difficult to have a good attitude when your goals are kinda vague. If you don’t have a good, concrete idea of what your goals are, you’ll burn out in no time. Once again, great post. I’ll be reading it again and again. Also sharing it too! That Is all i need to get back to my writing desk,Thanks for giving it to me.